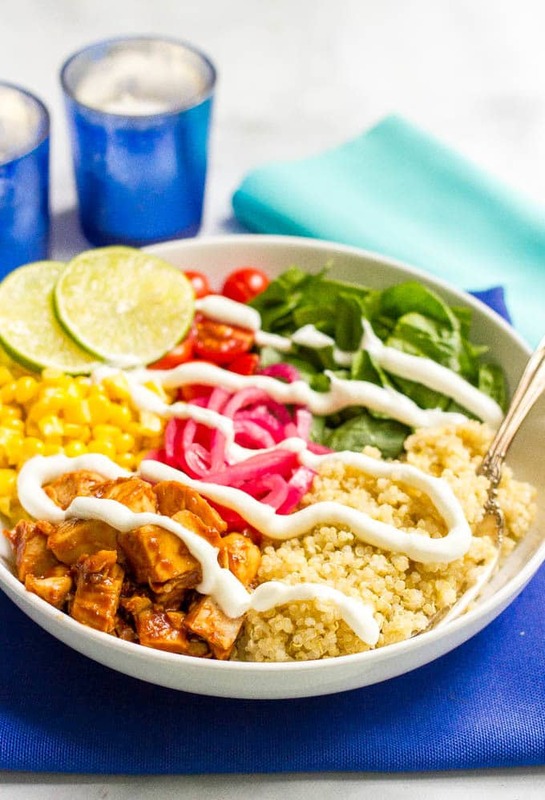 BBQ chicken quinoa salad bowls are full of flavor and fresh veggies and make for a really easy, healthy dinner! Also great as a make-ahead lunch or picnic! I hope all of my U.S. friends had a wonderful Memorial Day weekend! Pretty much fabulous all around and has me looking forward to the long days of summer stretching out before us! You know my healthy-eating-loving heart is doing backflips for this! I adore all the fresh summer produce and love putting together quick and easy salads for lunch, dinner, picnics – anytime! 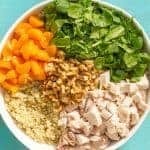 Some recent faves we’ve had on hand include my healthy basil chicken salad, tuna spinach salad, southwestern orzo salad and quinoa spinach salad with pesto. 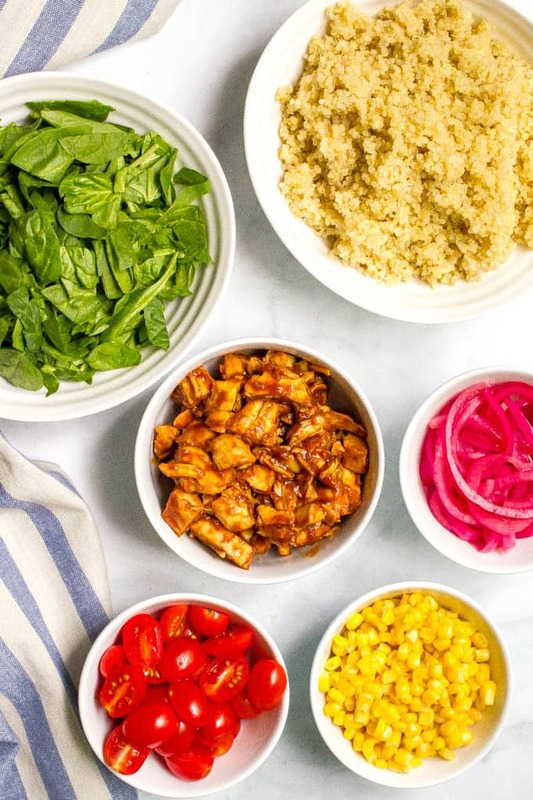 And I’ve got a new go-to favorite to add to the list: this BBQ chicken quinoa salad! Because I know that days when we are staying outside later to play and run around, or going to the pool for the afternoon, we come home hungry and ready to eat! I can get away with feeding the kids some leftovers or just pull something together quickly for them, before we do baths and reading and brushing teeth and bedtime. But then my husband and I still want to have a proper dinner — and I’m wiped! And hungry. And craving something filling but healthy, light but delicious. 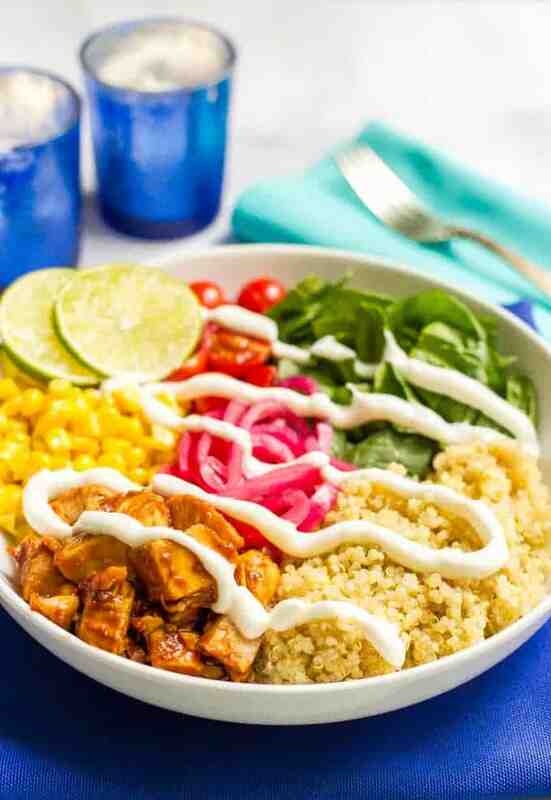 Just mix together a few simple ingredients and you can tuck into these tasty bowls with bold BBQ-coated chicken, soft, fluffy quinoa, fresh veggies and a creamy yogurt sauce to pull it all together. You’ll be happily hunting down a little bit of every ingredient for every bite. Ah, I love that! 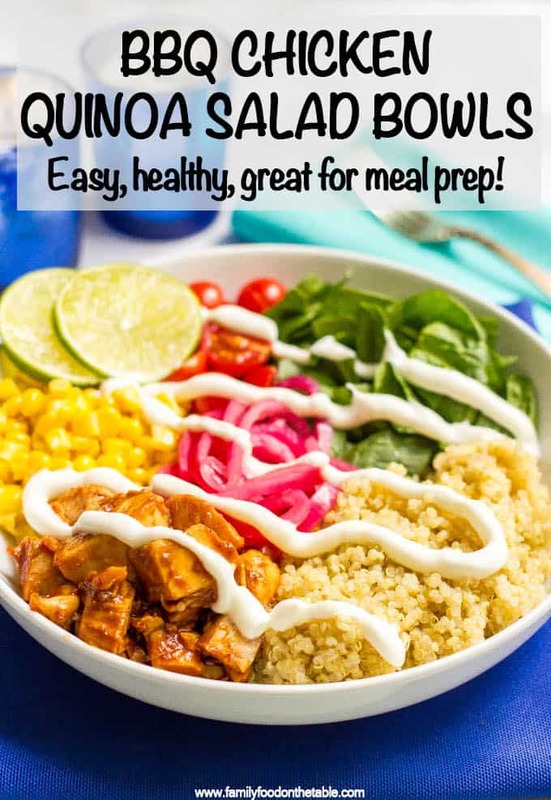 This is also a great meal-prep recipe because you can cook extra quinoa and chicken over the weekend or on another night when you’re making those and then these salad bowls will literally take you minutes to put together. Score! The quinoa needs to be cooked and cooled for this recipe, so plan accordingly. 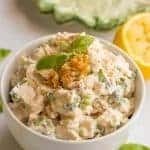 You can use some leftover baked or grilled chicken or pick up a rotisserie chicken at the store to use in this recipe. I’ve made this with and without the corn and it’s great both ways, so feel free to omit if you don’t have any. As for toppings, you could definitely add some avocado slices to this. You could also add some shredded or cubed cheddar cheese if you want. And here’s an easy recipe for quick pickled red onions if you want to use those – I love having a jar on hand in the fridge! 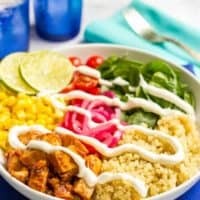 I hope you give these BBQ chicken quinoa salad bowls a try, either to mix up your lunch routine or to make a super easy dinner on a busy night. Happy cooking – or assembling! Cook quinoa according to package directions, then cool. Season with salt and pepper to taste. Combine the chicken and BBQ sauce in a small bowl until the chicken is well-coated. In a separate small bowl, mix together the Greek yogurt and lime juice. Season with a pinch of salt and pepper. 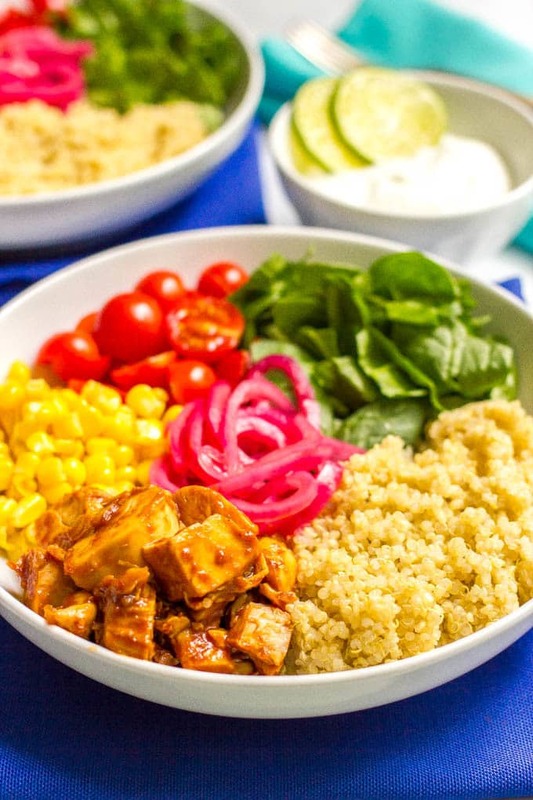 Arrange bowls: Divide the quinoa, BBQ chicken, spinach, cherry tomatoes and corn evenly among 4 bowls. Top with the pickled red onions and yogurt sauce. Serve and enjoy! My husband is allergic to avocado but you could definitely add some avocado slices to this salad. You could also add some shredded or cubed cheddar cheese. Here’s an easy recipe for quick pickled red onions if you want to use those. This looks too tasty! 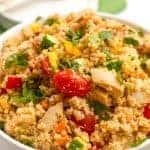 Love the summery feel of the bbq chicken mixed with quinoa and veggies. Perfect! I love BBQ chicken! 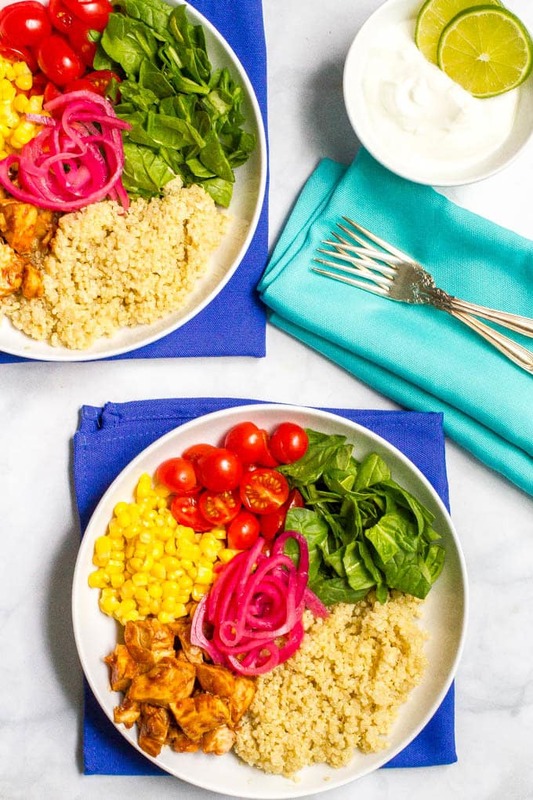 These bowls look delicious and it’s even better how meal-prep-friendly they are. Thanks so much Kelli! They are definitely great for prepping ahead to have ready to go! We also had an extra long weekend in Germany and it was great as well, lots of sun!!! 🙂 What a happy looking bowl, I love the colors. I love the flavors in this bowl! Thanks Jennifer! They go so well together! I would be super jealous of any coworker that had this! Beautiful! This lovely bowl looks very tasty and healthy, perfect for the spring and summertime. I love that you added quinoa in here! It’s one of my favorite things to add to salads! Yes! 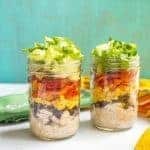 Adds great texture and makes any salad more filling! I love this recipe, so yummy to make!